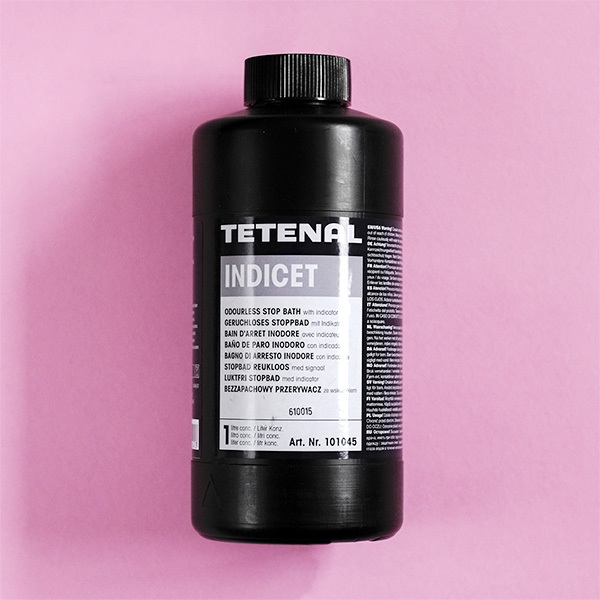 Tetenal Indicet is an odourless, citric acid stop bath. After development, we recommend that you rinse films and papers in an acid stop bath. Tetenal Indicet is odourless because of the use of citric acid instead of acetic acid. In addition, it includes an indicator to show when the stop bath is exhausted. You will see a colour shift from yellow to purple when the solution has finished. Tetenal Indicet is an odourless, citric acid stop bath. After development, we recommend that you rinse films and papers in an acid stop bath. This will stop development immediately. A stop bath will also neutralise the developer to help maintain the activity of the fixer bath. To significantly reduce the chemical smell when working in the darkroom, use Indicet alongside Tetenal Superfix Odourless Fixer. 1 litre of working strength solution will process up to 15 films. So you can get up to 300 films out of a bottle. To prepare your stop bath, dilute Tetenal Indicet 1+19. That means one part Indicet to nineteen parts water. The dilution is the same for both paper and film processing. Make sure you mix together thoroughly before use.